What does the future hold for Jimmy G? 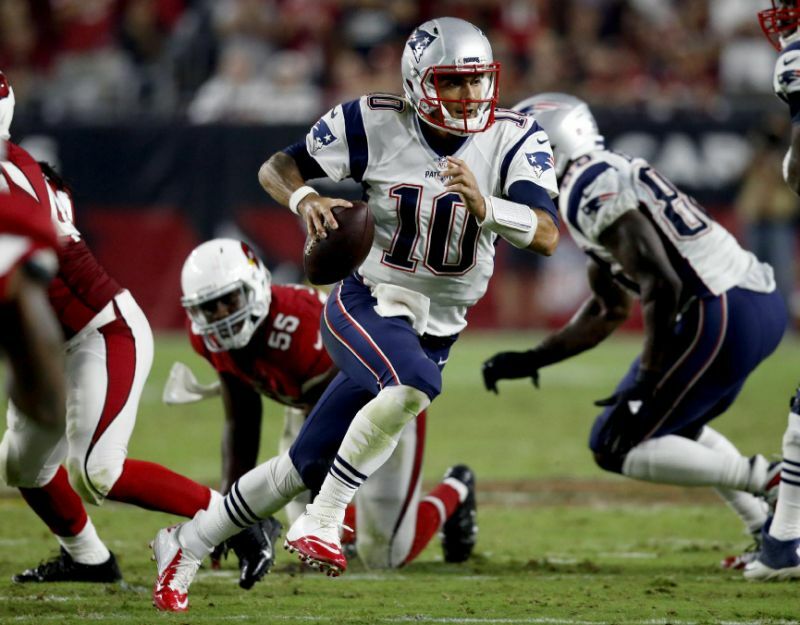 If you polled 100 people before Sunday night's showdown with the Cardinals and asked, "In your honest opinion, how you do you think Jimmy Garoppolo will perform against Arizona? ", I guarantee that 75% of those polled wouldn't have guessed anything near how he actually played. I, along with a majority of Patriots Nation, was pleasantly surprised with the way Jimmy threw the ball and how he managed to be calm, cool, and collected for virtually the entire game. It wasn't the same as watching TB12 drop back to pass but it was about the closest thing that New England is going to get out of a first-year starter. However, with his first and biggest game behind him, can we expect the same kind of performance out of Jimmy G the rest of the way? In a stat that means absolutely nothing, Jimmy Garoppolo is the first quarterback since Roger Staubach(1969) to win against Arizona in his first career start (via SportsCenter on Twitter). That has to bode well for Jimmy, right? Being in the same company as Captain America is no joke and if SportsCenter tweeted it, it has to mean something significant. Sarcasm aside, that win was possibly New England's best since winning Super Bowl 49 in that very same building, and they did it without the services of: Brady, Gronk, Solder, Lewis, Vollmer, Cooper, or Ninkovich. That is undoubtedly one of the more unbelievable wins that Belichick and company have managed to pull off due to the odds facing them. They went into that game as -9.5 underdogs in Vegas, and realistically (with no turnovers) they should have won that game by at least 10 points. Some credit definitely does go to the defense, who made stops when they needed to and maintained the same motto that has been instilled in them since they arrived in Foxboro, "Bend Don't Break". However, I give most of the credit for this win to Jimmy G and of course, Bill Belichick. No one, not even the "experts" over at NFL Network and ESPN, gave the Patriots a shot to win; even former Patriot Rodney Harrison said no way they win this game and Tony Dungy agreed (not that that should surprise anyone). But, just like every other year, they all forget that New England rarely loses a game that they are supposed to lose. In the Belichick Era, the Patriots are 5-1 in games in which they are over -9 underdogs. All of these analysts and media pundits alike bet on Jimmy G to falter under the lights and succumb to the stout Cardinal defense but he flipped the script and did just the opposite. He managed the game extremely well, put the offense in great positions to get points, called clutch audibles, and didn't get flustered like many thought he would. Not too many people are talking about it, but on that final drive, Jimmy only had two downs to work with for a majority of the drive. For some reason, maybe clock killing time, Josh McDaniels ran the ball to Legarrette Blount nearly every first down that drive, and every time Blount got either one yard or lost yardage (I'm not hating on Blount, without his 3rd and 11 first down run on the final drive the game could've ended up completely different). After that, it was 2nd and long, and Garoppolo only had two downs to get 10 yards, which he did almost every time. It doesn't show it, but before the pass was snapped, Jimmy went up to the line of scrimmage, called out an audible, and changed the play from what was probably a Blount handoff to the right side. He saw the single coverage down the sideline and noticed it was a rookie guarding Hogan, trusted his receiver to make a move to get separation, and then threw a beauty of a pass and hit Hogan in stride for the TD. That is a Brady-esque type of play and it tells you everything you need to know about Garoppolo going forward: he's learned from Brady and learned well, he has the knowledge to change plays at the line, and can make the easy and tough passes, like this one to James White on third down. 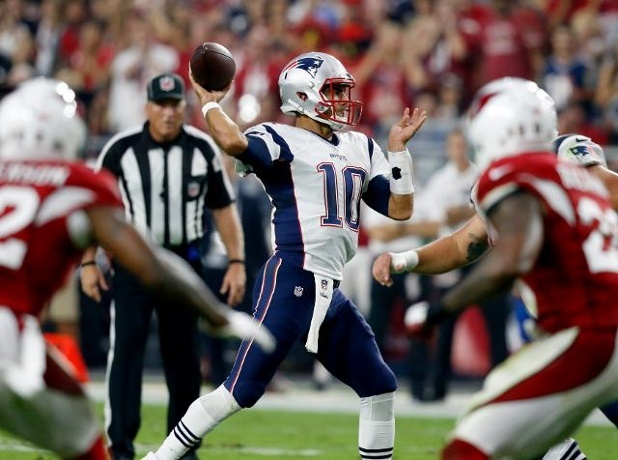 If you have any doubts about Jimmy G going forward, just think about this: he passed for over 250 yards with no interceptions against a Cardinals defense that was ranked top 5 in the league last year, was on the road, and had no Gronkowski. Oh, and he also got the W. As long as he can keep the Patriots in the game, which we all now know he can do, New England has a shot to come out of this 4 game stretch a perfect 4-0 or at least 3-1.